Stainless Steel Baskets are mainly used to utilize the maximum space in the modular kitchen in a practical and functional way. This allows the person to keep the items in an organized way and can take without bending and going inside the kitchen platform cabinet. 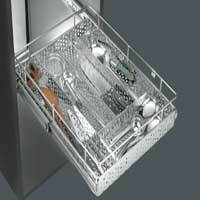 The Stainless Steel Baskets are available in various sizes, grades. The Stainless Steel Baskets are accessible at the market-leading prices. The variety available from us includes Stainless Steel Plain Basket, Stainless Steel Plate Basket, Stainless Steel Perforated Cutlery Basket, Stainless Steel Grain Basket, Stainless Steel Bottle Basket and Stainless Steel Cup & Saucer Basket. We are specialized in the supply of Stainless Steel Wire Baskets in various grades. Based on the experience of Indian cooking style, we have designed different type of baskets suitable to keep the kitchen accessories in practical and functional way. 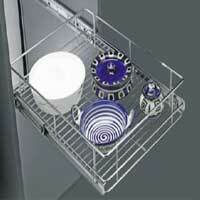 With this baskets and pullouts you will get a maximum storage space, in an organized storage and easy accessibility. 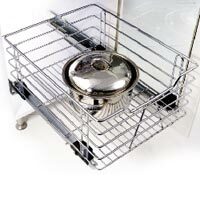 Stainless Steel Plate Basket is designed specially to keep the plate in an organized manner and utilize the maximum spaces. 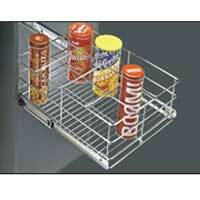 The Stainless Steel Plate Baskets are available in various sizes and grades. Stainless Steel Perforated Cutlery Basket of premium quality is available with us. Perforated cutlery made out of perforated stainless steel, will avoid hanging small spoons, knifes etc. 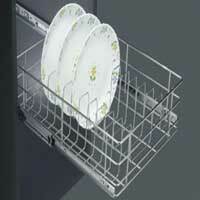 Steel Perforated Cutlery Basket is a better option than the normal wire basket cutlery or plastic tray cutlery. Avail the superior quality Stainless Steel Grain Basket from us. The Stainless Steel Grain Baskets are made from superior quality stainless steel. The Stainless Steel Grain Basket is highly modern and serves as an outstanding storage product for various kitchen articles like sugar, flour and various other food items placed in containers of various heights and sizes. Stainless Steel Bottle Basket of premium quality is available with us. 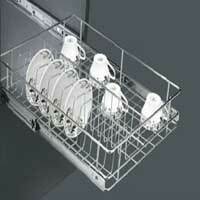 Fabricated from the superior quality stainless steel, our Bottle Baskets are highly popular among the clients. Avail the attractive range at very reasonable rates in the market. We offer an assortment of Stainless Steel Cup & Saucer Basket extensively used in kitchens for storing cup & saucer utilized in the kitchens. The Steel Cup & Saucer Baskets are available in different sizes and attractive designs for safe and convenient storage of essential kitchenware.